Fojtka, 7 km from Liberec: Modern, beautiful single-family house Mníšecká, 2 storeys, built in 2006. 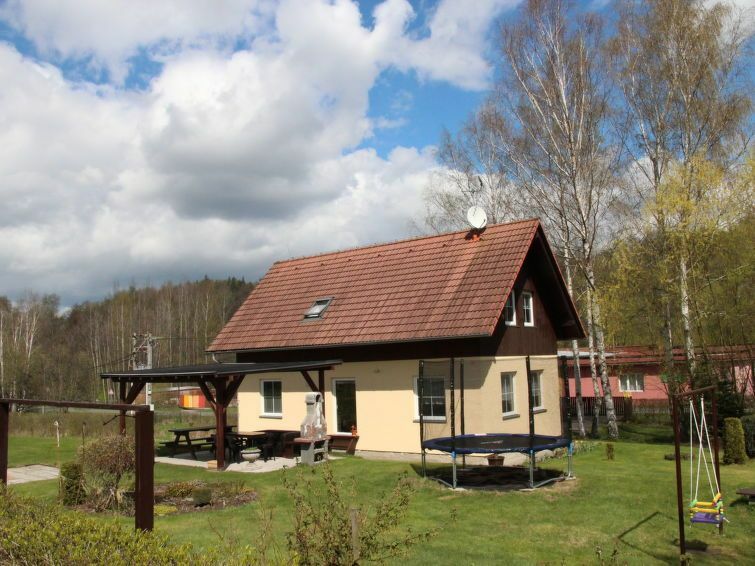 On the outskirts, in a quiet, sunny position, 200 m from the edge of the forest, 50 m from the lake. Private: garden with lawn, meadow 3'000 m2. Paddling pool, patio, garden furniture, barbecue, children's playground (swing, sandbox). In the house: WiFi, trampoline, storage room for bicycles, washing machine. Parking on the premises. Shop 1 km, restaurant 1 km, railway station Liberec 8 km, outdoor swimming pool 8 km, indoor swimming pool 8 km, swimming bay 100 m. Golf course 100 m, tennis 3 km, riding stable 7 km, skisport facilities 10 km, ski school 10 km, cross country ski track 10 km. Nearby attractions: Liberec 12 km, Frýdlant 14 km, Libverda Spa 17 km, Ještěd 18 m. Well-known ski regions can easily be reached: Bedřichov 17 km, Ski Ještěd 18 km. Overall very good accommodations for our family of four. Everything suitably stocked, plenty of linens, excellent high speed internet, comfortable, clean, nice location, courteous and attentive owner. This home in Mnisecka is as nice as it looks in the photos. The interior is very clean, with tasteful furnishings. Beds are comfy with nice linens.There are actually 3 bedrooms; all with european double beds; one bedroom includes a crib. A half bath downstairs; the upstairs bath has a tub with removable shower head - not really able to take a stand up shower (no curtain or shower surround) but good practice in using the European shower technique! An on demand hot water heater provides really hot water . The kitchen is very well-equipped; lots of dishes, glasses and cookware; some spices and basic baking ingredients. In the back yard there is a delightful covered seating area complete with picnic table, a leather couch, and a wood fired grill/fireplace. We also appreciated the outdoor clothesline to dry things cleaned in the downstairs washing machine. Something special was the short - 5 minute - walk to a small lake just to the north. A very nice walking/running trail goes around much of the lake and across a beautiful c 1850 stone-walled dam. At the end of our walk, returning to the house, there was a sweet Czech tavern with seats facing the lake, where we enjoyed a cold pivo (beer) and pickled cheese while watching the beautiful sunset colors in the sky. The house owner, Karel, met us when we arrived and went over the house systems. He spoke a bit of English but is fluent in Czech and German. The Internet was a bit spotty but was fast when working. Note that you NEED to have 6000 Czech CZ in cash as a deposit when you arrive. This is held to cover the cost of your energy use, which Karel read at the end of our stay. We used very little energy as it was warm enough to have the windows open at night. There is a bit or road noise during the day but the nights were quiet. Working with Interhome (VRBO Homeaway partner) was great - very clear documents and timely info/reminders. The Liberec region has many things to see. Just 25 minutes north of this house is the lovely castle Frydlant, absolutely worth paying for a tour. We also visited the 1960's mountaintop "spaceship" Jested, with 360 degree views of the lovely Czech countryside. Jablonec, glass working town, has a great glass museum and lovely town square. Liberec also has a lovely square, many good restaurants, a botanical garden with 6 greenhouse domes (situated in an area of absolutely beautiful homes), a zoo and nice museums. Sehr schönes Haus mit super Ausstattung. Wir hatten eine sehr schöne Woche.